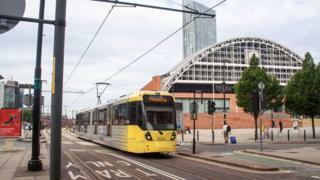 Drivers on Greater Manchester's tram network could strike over the August bank holiday weekend in a pay row. The Unite trade union said Metrolink drivers earn up to £7,000 a year less than counterparts who work in other cities around the United Kingdom. A ballot over strike action, which may disrupt the Manchester Pride festival, will run from Friday until 9 August. Metrolink operator KeolisAmey Metrolink (KAM) said it has made a "fair" offer and will continue talks with the union. The company said it has offered a 3.3% pay increase as well as a new deal for working unsociable hours. Unite regional officer Steve Davies said the union also had concerns about an increase in anti-social behaviour directed at drivers. "Our members feel it's time their hard work is valued with fair pay and a pay deal that addresses pay levels which sees them earn up to £7,000 less than tram drivers in other UK cities for doing the same job," he said. More than 340 staff will vote on whether to take industrial action. KAM said its priority was to continue with "meaningful discussion in a genuine attempt to find a resolution". Transport for Greater Manchester said it was "disappointing" that KAM and Unite have not reached an agreement. "We'd encourage Unite and KAM to continue these discussions with a view to finding a mutually acceptable solution," said its head of Metrolink, Danny Vaughan. Further talks will take place next week.